The Portsmouth History Society looks back on what was making the Sports Mail headlines on Saturday, March 9, 1968. Pompey staged a great fightback against West Bromwich Albion, before 42,642 fans at Fratton Park. But the Blues were unable to prevent their First Division opponents from reaching the FA Cup quarter-finals. Pompey held a slight edge over the visitors until Harry Harris was harshly adjudged to have fouled Jeff Astle in the 29th minute. And from Bobby Hope’s free-kick the centre-forward headed into the net. Clive Clark then stabbed home a second goal for West Brom four minutes later. Ray Hiron stooped to head Pompey back into the match on 75 minutes, and Albert McCann went near to equalising with a shot that zipped past the post. McCann, Mike Trebilcock, Ray Hiron, Bobby Kellard, Nick Jennings. Tony Brown, John Kaye, Jeff Astle, Bobby Hope, Clive Clark. Leeds United goalkeeper Gary Sprake was sent off after 75 minutes in his side’s FA Cup fifth-round tie at home to Bristol City, which Don Revie’s side won 2-0. Rotherham United, who were lying bottom ofDivision Two, held First Division Leicester City 1-1 at Millmoor. In Division One, Manchester City kept up the pressure on leaders Manchester United by beating Coventry City 3-1 at Maine Road. The goals came from Colin Bell, Mike Summerbee and Neil Young. Ipswich Town’s 2-1 win at Bolton put them fourth in Division Two and level on points with third-placed Pompey. Leaders Queens Park Rangers were held to a 1-1 draw at home by Hull City. Bury remained top of Division Three despite going down 3-1 at Bristol Rovers, while Torquay United’s 3-0 victory over Stockport County at Plainmoor put them level on points with the Shakers. Bournemouth drew 0-0 at home to Oldham Athletic, while Brighton went down 1-0 at Reading. Luton Town won 2-0 at home to Port Vale to keep them at the top of the Fourth Division. Aldershot lost 1-0 at Hartlepool. Bradford City decided to defer until the end of the season any new appointment as manager to succeed Grenville Hair, who collapsed and died during the week while supervising the team’s training session. 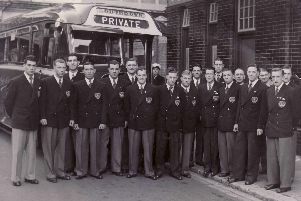 Jimmy McAnearney, the club’s player-coach, and captain Tom Hallett were to have full control of playing affairs in the meantime. The club’s scheduled match against Brentford at Valley Parade still went ahead, with the visitors winning 3-2. Blackpool Corporation announced that it was to seek permission to build a 100-acre zoo at Stanley Park at a cost of 300,000.